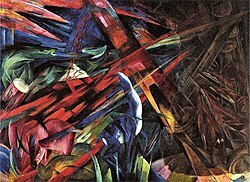 Franz Marc, The fate of the animals, 1913, oil on canvas. Displayed at the exhibition of Entartete Kunst in Munich, Nazi Germany, 1937. Eric Gill's modernist North Wind, 1928, for the London Underground's headquarters, at 55 Broadway. 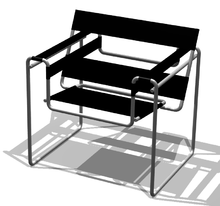 Modernism was a cultural movement in the first part of the 20th century. It occurred in art, literature, music, architecture and drama. Modernism rejected tradition. It was interested in new ways of doing old things. Also, there was a belief that science and technology could change the world for the better. Modernism began in the late 19th century and carried on until about 1950. The details differ greatly, and the term covers some movements which are somewhat contradictory. Art is where people can find Modernism. Modern art is what replaced classical art. It included Abstract art, Cubism, Pop art, Minimalism, and Dadaism. It affected sculpture quite strongly, though at the beginning sculptors like Rodin and Epstein made both traditional and modernist works. Henry Moore is one of the most famous modernist sculptors. Typical modernist painters were Picasso, Braque, Matisse, Kandinsky and Mondrian. Composers such as Stravinsky, George Antheil and Schoenberg are modernists. Stravinsky's The Rite of Spring (Le Sacre du Printemps) is a landmark work. Ballets such as The Rite of Spring and Les Noces (The Wedding) mark the arrival of modernism into this traditional dance form. Modern dance outside of ballet started with Isadora Duncan, Loie Fuller and Ruth St. Denis. James Joyce's Ulysses is the classic example of modernism in the novel. Ulysses has been called "a demonstration and summation of the entire Modernist movement". Modernism in architecture is found in the work of Frank Lloyd Wright, Le Corbusier, Walter Gropius, and Mies van der Rohe. Le Corbusier's famous remark "A building is a machine for living in" shows how different his thinking was to architects of the 19th century. A criticism of the modern movement is that it doesn't value tradition, and that it goes in for change for the sake of change. What Modernists want most is freedom of expression, or, perhaps, freedom of experimentation. This is why many modern paintings avoid making visual copies of real things. In modernist literature, an author may leave out plots or narrative or characterization in books. These experiments were not random. They drew on the ideas of their day: mass media, science and technology, Marxism, Freudian psychology, and so on. There was a general search for new materials, new methods and new ideas. There was often a rejection of elitism, and a love of populism and popular culture. Another criticism was of the connection between modernism and socialism. Certainly many modernists were also socialists. In the early days of socialism it seemed to offer hope of a new future without the baggage of the past. This also explains their rejection of tradition. ↑ Childs, Peter 2000. Modernism. Routledge, London. ↑ Lewis, Pericles 2000, Modernism, nationalism, and the novel. Cambridge University Press. ↑ Beebe, Maurice 1972. "Ulysses and the Age of Modernism". James Joyce Quarterly (University of Tulsa) 10 (1): p176. This page was last changed on 3 September 2014, at 18:39.